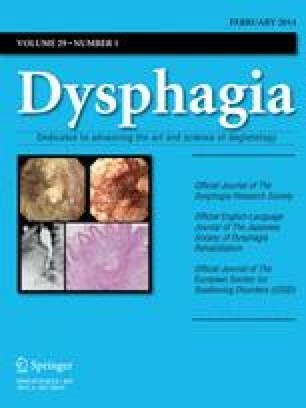 Accidental loss of food or liquids into the airway while eating or drinking is perhaps the most clinically significant consequence of dysphagia. Although videofluoroscopic recording of swallowing is the current gold standard for identifying and determining remediation for aspiration, results are generally described in descriptive terms, thus limiting information and lending to errors of interpretation. We previously published an 8-point scale to quantitate selected aspects of penetration and aspiration conveying depth of airway invasion and whether or not material entering the airway is expelled (Rosenbek et al., 1996, Dysphagia 11:93–98). The present study defines the distribution of the Penetration–Aspiration Scale scores in healthy normal subjects of different genders and ages. The scale was also used with two groups of patients known to have significant dysphagia relative to stroke or head and neck cancer. Significant differences found among groups are discussed. Key words: Penetration–Aspiration Scale — Airway invasion — Stroke — Deglutition — Deglutition disorders.